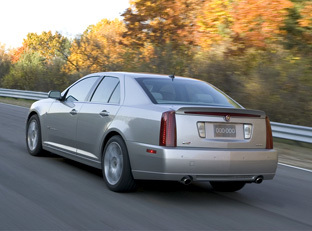 The Cadillac STS-V is powered by a supercharged, 4.4 litre, Northstar V8 developing 469 horsepower and 439 ft-lbs of torque mated to a 6 speed automatic transmission. 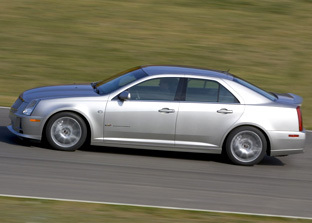 The during its development, the Cadillac STS-V was tuned for performance on virtually every road condition and environment including GMs all-new Milford Road Course facility and the Nordschleiffe (North Course) at Nurburgring. 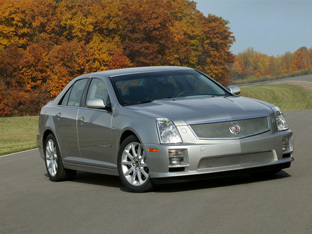 As a result of this extensive development, the Cadillac STS-V has track-capable acceleration, braking and cornering abilities. This is due, in part, to increased tire sizes (P255/45R18 front, P275/40R19 rear); increased brake rotor diameters, larger pad areas, and larger calipers; increased stiffness stabilizer bars and suspension springs; a faster steering ratio; and chassis tuning aimed at delivering high performance without punishing the driver.